Let $X$ ~ $Bin(n,p)$ and $Y$ ~ $Bin(m,p)$ be two independent random variables. Find the distribution of $Z=X-Y$. I also validated it by Monte Carlo simulation. 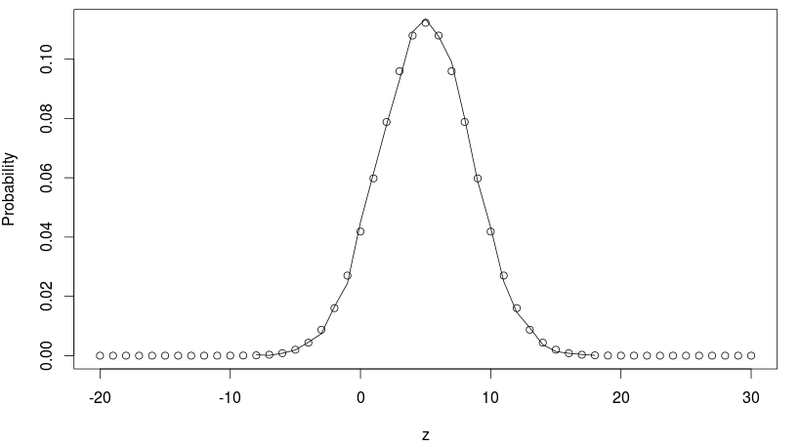 For $n=30$, $m=20$ and $p=0.5$, I get the following distribution, where the circles are the analytical probabilities and the line connects the MC estimates. Because that looked to me pretty much like a binomial distribution, I gave it a try and figured out that its actually a binomial, just shifted by m to the left. This can be simply written as $P(Y=y) = Bin(y+m, m+n, p)$. Hence, given equal success probabilities, the sum of two independent binomially distributed random variables is binomial, but also their difference, just shifted to the left. This question here difference between independent binomial variables is actually the same as mine, but received no answer and only the comment that there would be no simple formula. But the above formula looks pretty simple to me. Is it correct that for the case of equal success probabilities, the above equations actually describes the distribution of $Z=X-Y$? I read in a book that $Z$ could not be binomial distributed because it had negative support. Is it right to call it a shifted binomial? Your $Z=X-Y$ will not be a "shifted binomial" unless $p=\frac12$, or the trivial cases where at least one of $n$ and $m$ is zero. For the case $p=\frac12$, $m-Y$ has the same distribution as $Y$ so $X+Y$ and $X-Y+m$ have the same distribution, which is indeed binomial. So for $Z+m$ to be binomial and to be supported on the integers from $0$ through to $n+m$, if its parameter was $q$, its mean would be $(n+m)q$ and variance $(n+m)q(1-q)$. To have $(n+m)q(1-q)=(n+m)p(1-p)$ requires $q=p$ or $q=1-p$ or $n+m=0$ (i.e. $n=m=0$). To have $q=p$ or $q=1-p$ and the two expressions for the mean equal requires $(n+m)p=np+m(1-p)$ or $(n+m)(1-p)=np+m(1-p)$, i.e. $mp=m(1-p)$ or $n(1-p)=np$, which would require $p=\frac12$ or $m=0$ or $n=0$. So the only case where $n\gt0$ and $m\gt0$ where the means and variances match a binomial distribution is when $p=\frac12$. Not the answer you're looking for? Browse other questions tagged probability statistics random-variables or ask your own question. Is the sum of two independent geometric random variables with the same success probability a geometric random variable?